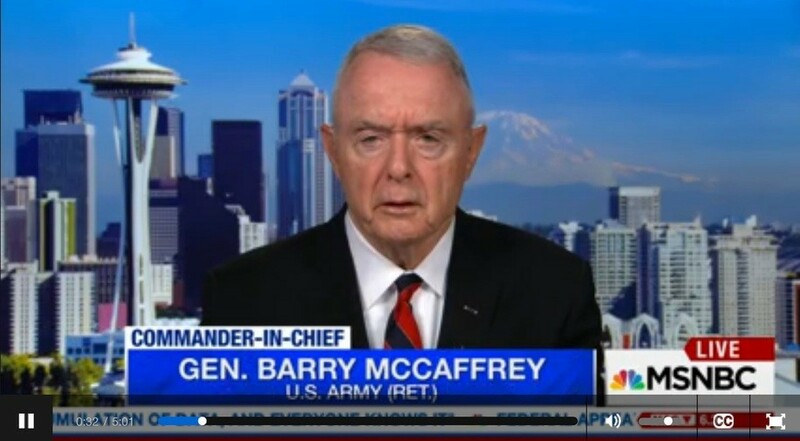 The highest decorated officer still living, 4 star General Barry McCaffrey has publicly declared that the republican President Donald J. Trump is a serious threat to US national security. He is seeing what many of us have observed. The president walks, talks and acts like a Russian asset to where it is influencing his policy making. He has great difficulty when it comes to taking action against Russia interests when it conflicts with US national security interests. Barry McCaffrey graduated from the U.S. Military Academy at West Point, Class of 1964. His combat tours included action in the Dominican Republic with the 82d Airborne Division in 1965, advisory duty with the Army of the Republic of Vietnam from 1966-67, and company command with the 1st Cavalry Division from 1968-69. He earned TWO Distinguished Service Crosses in Vietnam, in addition to TWO Silver Stars as well as other awards including 3 Purple Hearts. He retired as a U.S. Army (4-Star) General and, at the time of his retirement, was the youngest General in the Army. In retirement he gained notoriety as a news commentator, as well as in taking an active role in American Politics. He also returned to the Military Academy as an adjunct instructor. The President of the United States of America, authorized by Act of Congress July 9, 1918, takes pleasure in presenting the Army Distinguished Service Medal to Major General Barry Richard McCaffrey (ASN: OF-101587), United States Army, for exceptionally meritorious and distinguished service in a position of great responsibility to the Government of the United States from August 1990 to March 1991, while serving as Commanding General, 24th Infantry Division (Mechanized), during Operation DESERT SHIELD and subsequently Operation DESERT STORM, and the liberation of Kuwait. General McCaffrey’s gallant leadership, significant tactical acumen and exceptional professional competence in all aspects of his performance of duty during these operations was singularly outstanding. Major General McCaffrey’s performance is in keeping with the highest traditions of the military service, reflecting distinct credit upon him, the 24th Infantry Division (Mechanized) and the United States Army. For us it is not a surprise but now this man of some stature and substance is saying it where those who want to pretend differently, realize that there is nowhere to hide. The evidence is overwhelming. When will it bring about some sort of meaningful action? The US Congressional republicans will get on-board in taking their oversight duties more seriously when they are faced with the news that they may lose any future elections because of their inaction to protect our country against the likes of Russia. As more of General McCaffrey’s stature come out to say the obvious which is, our president is a danger to our US democracy, it tears off the blinders of the those GOP members who want to pretend otherwise. This next week, I’ll be calling every legislator in the US Congress to demand a bill to protect the jobs of DOJ’s Rod Rosenstein and FBI’s Special Counsel Robert Mueller III. And I’ll be asking them to protect Andrew McCabe’s pension. The US Congress has to send a message to the president to step down on his attacks based on political motives. Thanks Gronda. You are a beacon of truth and a maven of influence. PS – You may want to take a peek at John Brennan’s comments following the McCabe firing. He pulls no punches.